I’ve been interested in this for a long time, but never got up the nerve to read my old journals. Today, rather than catch up on laundry or do dishes (my now-deformed belly button (thanks for saving my life and all, but did you have to mutilate my belly?) started hurting so I had to take to the couch) I decided to brave it. Did I physically cringe when I read that stuff? Oh, yes. Yes I did. Part of the cringing is from how boring the entries are. 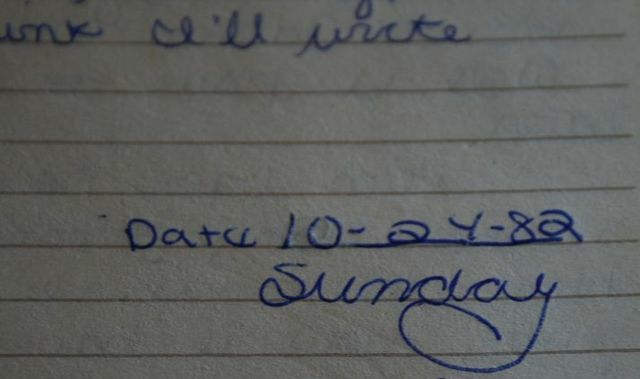 The oldest journal I found is one that I started in January of 1980, but I clearly remember that one of my earlier ones had months of dated pages that I never filled in. My solution was to go through later and write, in black ballpoint pen, "Reg. day at school." on every single page. I hope I do find that one someday, because, well, just because. Here’s part of an entry from 1982. I was twelve.
. . . maybe he will like me someday. I have a new skirt. I found it at soccer practice. It is a Gunnie Sac. It is a size 5 juniors, I can’t wear it yet. I always wanted a prarie skirt. See what I mean? I always wanted a prairie skirt? 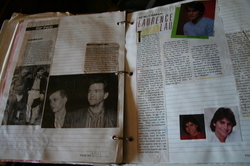 Here’s a photo of an entry a few pages later on. Left to right: much younger versions of Mel Gibson, Timothy Hutton, and John Stamos. I don’t remember who the other guy is, but I think he was on All My Children. I was thinking, as I cringed through the pages, how very, very glad I am that I didn’t have blog access at this time in my life. I wonder how many kids who are now blogging their adolescence will be legally changing their names when they turn 30 to escape from their online journals. Or, maybe so many people will be in the same boat that they won’t worry about it. I’m not even sure what to do with my journals. I don’t particularly want my great-grandkids looking to them for clues as to what I was like and I certainly don’t enjoy reading them, but it seems wrong to burn them or put them in the trash. Maybe I’ll salvage the worthwhile pages and toss the rest. I still am shocked, seriously shocked, to see how frequent and how passionate my crushes were. I always thought I was such a smart girl. This entry was posted in Uncategorized on May 29, 2007 by jenijen. I couldn’t keep my journals in any incarnation. They were destroyed before I could get very far. i came home from school one day, i was in the 7th grade or so, and my stepmonster surprisingly had took the day off from work and *as i was walking in the door* she tossed my journals into the raging fireplace one by one. and i never kept a journal again. Oh yes… I have a journal that is missing in action. I have since realized that one should never put into writing what one doesn’t want their mother to read. EVER. And so, I write with a knowledge that ANYONE could come upon my writing and read it. And it makes me think twice. I need a ritual burning. Not one instigated by a step-monster–that’s just horrible and abusive. But a nice night out by the weber grill. Drinking wine, laughing at the pages and tossing them in one by one. I think I have a plan for the next full moon–drunken journal burning. I wrote get well soon comments on all your previous posts, but they don’t seem to have shown up, perhaps I did something wrong. but, get well soon, ok. I wonder if we will look back in twenty-five years at what we have written and feel that way? fortunately i left a box of my journals in the garage for 5 years and now they are mildewed. they are still legible, but i’m terribly alergic to them. i can keep them for sentimentality, but never again have to read them! i do hope you are resting a lot and feeling better soon. My first journal is from 2nd grade – embarrassing, yes, but nothing compared to my jr. high journal! “He looked at me again today. Maybe he likes me”. I’ve kept them all, and I still journal. But I like to think I’m more interesting now. Or so I tell myself. Laurence Lau was indeed on “All My Children”. He was Greg of the famous Greg and Jenny super-teen couple. I know this because it is exactly the kind of thing I remember from 1982, but I can’t remember where I put my keys or whether or not I packed my kids lunch. Don’t throw them, you will regret it if you do. Just put them back in the box they came from then if you want to look at them in 20 years time and have a chuckle they will be there. Gone is final you can never have them back.